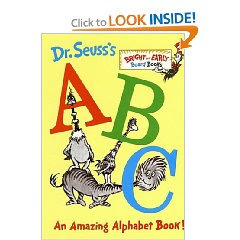 Today we started our count down to Dr. Seuss' (Theodor Seuss Geisel) birthday! To celebrate letters we ate words (in the form of pancakes) and played "Musical Letters!" 2-"squirt" your letters onto the pan. Note: It is easier to do whole words if you use the bigger griddles. It also makes it easier to serve a whole word (or name) all at once. My kids loved these and ate a lot more letters than I thought they would! To play the "Musical Letters" game you will need: a stack of paper plates, markers, music player. 4- When the music stops, each person says the name of their letter and/or the sound it makes and/or something that starts with that letter (depending on how old the children are). 5- Turn the music on and do it again. Note: you can take away a paper plate each time if you want to play it like musical chairs. We left all of ours out so that we got a lot of practice. My kids loved this game and didn't want to stop playing! Stay tuned for more Seuss fun...we will be celebrating and sharing what we do. Seuss' actual birthday on March 2nd. We will become authors and make a book too! 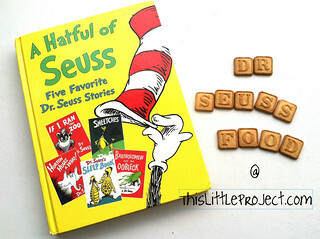 Check out more of our Dr. Seuss Food fun! I love the cake walk activity. That gives me a great idea to do this afternoon. And making letters out of pancakes?? Very clever. Thanks -- I love this blog! Love the squirt bottle idea! I'm excited to try it for my kiddos. Thanks for all your clever ideas. I have enjoyed looking at your blog.